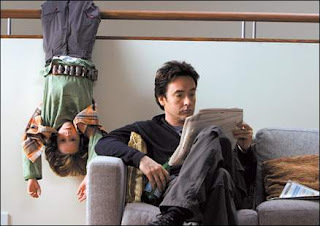 Unlike other prospective adoptive parents, David (John Cusack) tells his sister Liz (Joan Cusack) that he doesn’t want a happy little Gap kid who goes with the flow. When Dennis, a six year old boy who spends most of his time in an oversized Amazon.com cardboard box (complete with the “Fragile: handle with care” warning) is ready for adoption, caring and good-natured Sophie (Sophie Okonedo) believes she has the ideal match for David. The fact that the previously emotionally abused Dennis believes he is from the planet Mars has classified him as difficult to place so Sophie figures that David, a successful and admittedly odd science fiction writer may be just the right key to unlocking the mysteries of Dennis’s world. Dutch Academy Award nominated writer turned director Menno Meyjes reunites with his Max star Cusack for this touching film based on the book by David Gerrold that channeled his feelings as a gay science fiction writer adopting a son in an appealing screenplay by Seth Bass and Jonathan Tolins. Obviously fearing the market for a film about a gay father, Cusack plays a straight widowed writer still reeling from the death of his wife two years earlier who finds himself questioning the justification in adopting the child he and his wife had wanted alone. As Roger Ebert notes, “few actors in the right role can be sweeter or more lovable than John Cusack…” and this is precisely the case yet again as from the moment the film begins and his character is explaining his past as a childhood outcast, we’re instinctively on his side and buy the film even at its most ridiculous and its most precious as the endearing David caters to the whims of his new “Martian” boy by purchasing numerous boxes of Lucky Charms at the local grocery store (the only food he eats) and helping him with his duct taped homemade battery weight belt to prevent the boy from “floating” away. The film features a winning Amanda Peet as the free-spirited Harlee, David’s best friend who bonds with Dennis and expectedly finds her relationship with Cusack complicated by his incessant flirting that, despite its feeling of ritual does eventually result in a subtle romantic subplot that luckily doesn’t veer the film away from its roots as a parent and child film. While some critics labeled it K-Pax meets About a Boy, I found the entire concept charming and handled with the utmost sophistication until I’d say about three fourths of the way through the film when it began to suffer from I Am Sam syndrome with one too many endings and a few contrivances that tried to bog the quirky movie down to a saccharine melodrama with forced speeches and predictable plot points. I actually found myself wondering at what point the film started to veer off course in the production in either the rewrite stage or test market but it may indeed have been the latter as IMDb cited a Los Angeles Times article revealing that director Jerry Zucker was brought in to film new footage only a few months ago. Still, despite the endings, Cusack is always a joy and Martian Child will definitely strike a chord with audiences who seek it out amidst the large spectacle films of the holiday season.